MYFOXNY.COM - With temperatures are dropping and water starting to freeze on the Hudson Rover, the Coast Guard has begun its annual ice-breaking operations. Five cutters will help maintain waterways open to commercial vessels from New York City up to Albany until the mid-March, the Coast Guard said. "An average of 300 vessels transit the Hudson River during the winter months, carrying over 5 million barrels of petroleum products to the communities of this northern region," said Lt. Cmdr. Edward Munoz, of Coast Guard Sector New York . "This includes home heating oil, which impacts hundreds of thousands of people in our area." The Coast Guard Cutters Line, Wire, Hawser, Morro Bay, and Sturgeon Bayare assigned to ice-breaking. Other vessels are standing by in case any of the ships go down for maintenance or the ice season gets worse, said Petty Officer Third Class Barbara Patton. The Coast Guard breaks ice on the river to keep it clear for commerce and travel, as well as for safety and security reasons. Coast Guard, police, fire, and other official boats need to be able to carry out search and rescue, law enforcement, homeland security, and other emergency missions. "In addition to our icebreakers, the Coast Guard Auxiliary conducts daily reconnaissance flights, providing updated information about ice conditions which is then transmitted to waterway users," Munoz said. Ice yachting on the Hudson off Athens, N.Y.
MORE than 100 years ago, people regularly congregated at the Hudson River for winter entertainment and recreation. It was not uncommon to see thousands of people gather on the frozen river for carnivals of music, dancing, food, skating and, most thrilling, ice yacht races. The enthusiasm for the sport a century ago is not surprising, given that the boats could reach speeds well above that of the trains running along the river. The sepia-toned era of winter sports on the Hudson is largely dead, not because of advances in home entertainment or newer extreme sports, but mainly because of a pattern of warmer winters, the river simply doesn’t freeze over as often or as deeply as it once did. The long seasons of yesteryear, with dozens of ice yachts and large crowds of onlookers, has turned into the occasional weekend outing, with a small but dedicated group of enthusiasts keeping history alive. The last day of January marked the start of the ice sailing season on the Hudson this year, but could just as easily mark its end. There are spots elsewhere that more reliably ice over, but for New York’s longest river, where the sport earned fame, the opportunities are now fleeting. In a typical year there might be a two-week window. Last year, there was no ice sailing on the river. “You may get three years in a row, and then you may not be on it another five years,” said John Sperr, one of the organizers of the Hudson River Ice Yacht Club, a group of about 60 members founded in 1869 by John A. Roosevelt, Franklin’s uncle. On this particular day, the four main elements needed for good ice sailing came together: ice (or “hard water,” at least four inches thick), consistently cold weather, not a lot of snow and, of course, wind. When these stars align and the ice boats, some of which began sailing on the Hudson in the late 1800s, reappear, it’s like a wintry Brigadoon. “You have to have a lot of delayed gratification for this sport,” said Jack Weeks, a physician in Kingston, N.Y., as he assembled the 100-year-old, two-man Greyhound ice boat at the public boat launch in Athens, about 120 miles north of Manhattan. A mile-or-so stretch of water beside the small town has the advantage of being cut off from the wider river by an island, creating shallow depths good for forming ice and safe ice sailing away from traffic on the main channel. These antique vessels of timber and canvas sail cloth function similarly to their “soft water” counterparts, and there is some shared terminology, but the boats themselves look nothing alike. The hull of an ice yacht looks like a balance beam laid perpendicular onto a bench with a flag pole rising from where they meet. This wooden cross is held together by cables and turnbuckles all sitting on three machete-size skates. During assembly and between sails, the sailors love to pore over the details of the boats’ graceful construction and how they manage difficult repairs to these 100-plus-year-old vessels. As a matter of principle, repairs are made with materials available to the original craftsmen. “Sometimes just fixing and taking care of them is as fun as anything,” Mr. Weeks said. There are newer boats that come as well, like the DN class two-man racers that get their name from a Depression-era design contest held by The Detroit News. There’s no palpable snobbery between those keeping up vintage wood boats and those sailing fiberglass descendants. Up close though, it’s the old, handcrafted ice yachts that draw attention. Even when everything goes smoothly and nothing breaks, you’re exposed to temperatures that threaten frostbite. 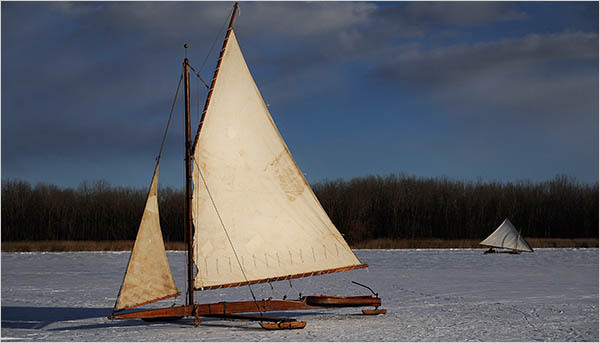 The premier boat out that first full day of the season was the Vixen, built in 1885 with a speed-enhancing sail, called a lateen rig, that so impressed John Roosevelt he bought it on first sight. The Vixen’s current owner (or as he puts it, “it kind of owns me”) for the past 35 years is Reid Bielenberg, a longtime restoration craftsman in the Hudson Valley. He sees a long life for his boat. “She’s 120 years old and has at least that in her,” he said. Despite its advanced age, the Vixen is a smooth flight, especially when you quietly glide on a clean straightaway. Full speed on choppy bits, on the other hand, rattles the frame and tackle into a thrilling roller coaster clatter. Throughout the day more boats arrived. With them were families with small children, groups of friends and solo enthusiasts. The regulars largely know each other, many being members of the dues-short ice yachting clubs of the area. Then there were the gawkers. Local photographers shooting the boats, new enthusiasts patiently waiting for an invitation to ride and others who just happened by and stopped for a closer look. The last stream of onlookers marveled, some even tiptoeing out on the ice to ask a few questions before leaving. At the end of a day of hard-water sailing, after the sun set and the wind died down, food arrived, beer and wine were poured and a fire stove was lighted, building a living tableau of Hudson winters past. ATHENS - The thought of slipping and sliding on icy roads strikes fear into the hearts of landlubbers everywhere who often dread ice storms even more than snowstorms. But reports of an 8-inch ice cover on the Hudson River drew ice yachters from as far away as Long Island and Montreal to the Athens Boat Launch this weekend. According to the 2000 Travel Journalist of the Year, Peter Guttman, ice yachting is one of the top ten most thrilling adventures in North America. “Fly across tide warped floes as frigid wind gusts power classic ice yachts and yank the tears from your eyes,” he writes on his website. Saturday's conditions were near perfect. The day was crisp and bright, warming temperatures hadn't yet turned the ice to slush and the wind was just strong enough to allow craft to speed along without a yachter losing control. A tall man, striking in his coyote-skin hat, Vargo lamented that he wasn't able to be out on the ice himself this year because of a recent hip replacement, a bad ankle and a knee injury. But that didn't prevent him from cheering on others from the sidelines. Most of the enthusiasts who showed up for the Athens event were either from the Shrewsbury Ice Yachting Club or the Hudson River Ice Yachting Club. With the help of modern technology, the National Weather Service, websites and e-mail, members know up to a week ahead of time whether conditions are right in any particular spot. Enthusiasts check the websites regularly. So many headed to Athens this weekend that the launch area couldn't accommodate all the cars and some had to park along the Route 385 shoulder. Warm weather over the past few days has been great for ice conditions, leveling the snow and making the gliding smoother. “A strong sun improves the river ice, as long as it's not too hot,” said Vargas. Many of the yachts at the Athens Event were restored bow-steering or stern-steering craft and carry crews of up to three or four. Traveling at speeds of up to 40 to 70 mph, clubs and individuals often hold races strictly for bragging rights. Because of what look like promising weather, the Athens boat launch may host the ice yachters again next weekend. For more information on ice yachting go to http://hriyc.org orhttp://www.nsibyc.com. HUDSON RIVER – The winter’s extremely cold temperatures pose a serious problem for ships and barges going up and down the Hudson River and that’s where the US Coast Guard comes in. The cutter Penobscot Bay goes up and down, breaking up the ice to allow for passage of vessels, and on Tuesday, Congressman John Hall took to the wheel of the cutter to see firsthand what its crew of 19 does to help commerce move. “Not only keeping the shipping lane open so we can get fuel oil, which comes by barge to the Newburgh waterfront as well as further up the river to other sites, but also for shipping ships and barges that go all the way to Troy and the Port of Albany,” he said. The Coast Guard also patrols the Hudson for homeland security purposes and for Indian Point security. ABOARD THE USCGC PENOBSCOT BAY -- Just before 8 a.m., with the air temperature trying to climb out of the single digits, Lt. Marshall Griffin and his crew of 21 prepared Wednesday to perform their daily angioplasty on one of Upstate's main commercial arteries. The 140-foot U.S, Coast Guard Cutter Penobscot Bay is targeting the near-constant encroachment of ice in the dark 32 waters, which threatens to bog down Hudson River traffic and, among other things, the flow of barge-borne home-heating oil to the region. The ship sat moored in the shadow of the cargo-ship Hamra at the Port of Albany where, overnight, an inch-thick skein of plate ice had grown around the ship. For the Bayonne, N.J.-based Penobscot Bay, which helped the Canadian government free the ice-bound St. Lawrence Seaway last spring, this is like a skilled martial artist trying to chop through a saltine. No sweat. But several miles south of Albany, where 4 and 5-inch thick chunks of broken plate ice bob and bunch up and refreeze, and the navigation channel closes to only a couple-hundred yards, the ship's true mission becomes clear. "Commerce would come to halt, as it does with the Great Lakes in the winter, if it weren't for the guys in the Coast Guard," said Richard Hendrick, port general manager. The concern is not so much that a renegade chunk of ice will gash a ship and send it Titanic-style to the river bottom, but rather the ice's choking grasp will bog vessels down, clogging shipping lanes and exposing their barges to crosswinds that could push them aground. "The power of the ice, especially when it gets thick, is pretty sobering," said Lt. James Collins, the ship's executive officer, who originally is from Kinderhook. Collins said the ice wreaks havoc on navigational buoys, dragging them around despite cement sinkers weighing between 8,500 and 12,500 pounds to anchor them in place. "This year seems to be considerably thicker," said Capt. Patrick Kinnier, port captain for New York City-based McAllister Towing, a tug company that hauls barges up and down the Hudson. Kinnier said he's received reports of ice as thick as 6 to 10 inches at the river's notorious chokepoints World's End, near West Point, and Crumb Elbow in Dutchess County where the river bends. Despite this winter's frigid temperatures, the ice isn't necessarily thickest to the north. The shape of the river and movement of the water affects the conditions. One of a tug captain's biggest concerns, Kinnier said, is that the ice dramatically slows a boat's speed, leaving it vulnerable to the heavy, slow-to-stop barge behind it. With a bottom shaped like a football and a 5/8-inch steel ice belt around its waterline, the 662-ton Penobscot Bay may heave wickedly in open seas but is uniquely suited for chugging through ice as thick as 30 inches without needing to back up and ram it. The ship's engines push the bow up onto the ice, forcing the stern lower. But, naturally buoyant, the stern rises, pushing the bow back down on the ice and sounding like a grinding steam engine as it surges forward. "The ship wants to stay at neutral, on an even keel," explained Griffin, the ship's captain. What you don't see is the "bubbler" system that bathes the hull in low-pressure air bubbles, lubricating its path through the water. The ship also is designed to cut a wide, rolling wake to further shove aside the broken ice, breaking "a path for a ship much larger than yourself," said Griffin. The crew is expected to patrol the river, based loosely out of Kingston, until early next week, Collins said, before ceding the ice watch to their sister ship, the USCGC Sturgeon Bay. "There's no place better than the Hudson River," said 1st Class Petty Officer Patrick Haney, who originally is from New Jersey but has spent five years on the river. "It's beautiful country up here." The Newburgh-Beacon ferry sits idle in the frozen waters of the Hudson River at the Newburgh Ferry Terminal on Wednesday. Service to the Beacon Metro-North station has been suspended. What is shaping up to be the worst ice season on the Hudson River in five years forced the suspension of commuter ferry service Wednesday. Both the Newburgh-Beacon and Haverstraw-Ossining ferries will remain in dock until at least Tuesday. Buses will be used in the interim to transport commuters between the parking lots on the west side of the river and the Metro-North stations on the east side at no extra charge. "Just show up like always," said Pat Smith, a spokesman for NY Waterway, which operates the ferries for the railroad. "We'll get you there and back." Smith said buses were on stand-by Wednesday morning but the ferries were able to deliver 450 commuters to their trains without incident. The decision to suspend service was made as soon as the morning rush ended. "Newburgh is one of our worst areas right now," said Chief Warrant Officer Darren Pauly, who supervises the U.S. Coast Guard's ice operations in the river. "And the ice is generally much worse than last year, when we had a pretty mild winter. We're thinking this could be the worst ice season in five years." Pauly said the high volume of ice has caused the Coast Guard to deploy two ice breakers to keep the commercial shipping channel open to Albany. He added that he expects at least one, if not both, of the ice breakers will remain on the river for the next month. The effort, however, doesn't aid the ferries since they are small boats vulnerable to damage from the big, fast-moving floes. In addition, the natural design of Ossining's harbor is notorious for trapping ice, making it impossible for the ferry to get close to shore. Since the Haverstraw-Ossining ferry debuted in 2000, ice has stalled its operation six of the subsequent eight winters — for as long as six weeks. Newburgh-Beacon, now in its fourth winter, has a better record despite being farther north. Commuters, however, have no quarrel with the temporary use of buses and report the substitute service operates smoothly.